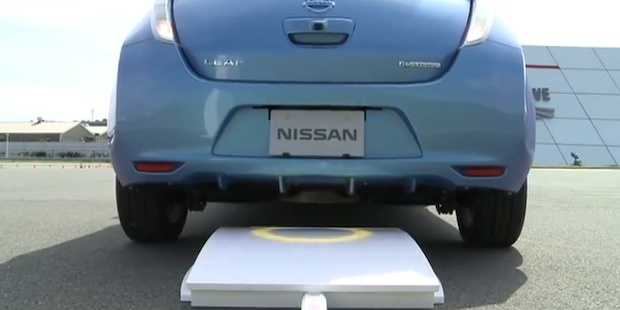 Nissan has a new trick: the wireless charging of its electric vehicle. Is it enough to power EV industry sales? Wireless charging is still not common, particularly with the disappearance of the Palm Pre, which was one of the main gadgets to utilize the trick for ultra-convenient connection to a battery-boosting charger. That makes Nissan’s moves with its Leaf EV all the more interesting: To charge your 2013 Leaf, all you’ll have to do is park it on the requisite spot of your garage. The setup is rather simple at first glimpse: Instead of flipping open a door on your car and connecting in a large electric plug, wired to a wall charger point, you reverse your Leaf over a large plastic pad on the floor. But this otherwise innocuous pad contains the coils of a wireless induction loop and some electronics–induction is how electricity makes its way through a transformer, magnetically, with no physical connection between the coils. And you can think of the pavement pad as one half of a transformer. The other coils are installed beneath the floor of the Leaf itself. To charge it up the car is electrically reversed over the pad into the sweet spot with the aid of a dashboard display; sensors tell the car when to stop. Turning the main alternating current on connects the loop in the pad with the loop in the car, and after being converted into DC, it can charge up the car’s battery. The simplicity and benefits are obvious for EV users, who would simply have to park their cars at night in order to drive away with a full battery in the morning. No messing with plugs or cables–which saves time, and could be safer. That’s why Nissan has revealed it’s making the charging system available for new Leaf vehicles from 2013 (though it’s unlikely it’ll come to earlier vehicles in a retrofit). But there are also other benefits that are more commercial in nature: Due to their more resilient design, and zero reliance on users connecting up electrics correctly–including not dropping the heavy plugs accidentally, or driving off with the cable hooked-up–it’s possible that wireless charging mats like this will become commonplace at roadside rest stops and garages. This would cause more frequent stops for motorists, what with range anxiety still a real concern for EV drivers. That’s something that driving safety campaigners, worried about drivers falling asleep at the wheel, may welcome. And the roadside cafe industry may also like the idea. With all the competing designs for an EV charger port, it’s also possible that mats like this could have a “universal charger” element. Because they don’t demand a physical connection to the car, they could be designed to be automatically configurable to suit different cars’ electrical needs. That’s looking into the far future. For now Nissan is perhaps the first among many to come to market with this tech. There’s just one drawback to inductive charging. It’s wasteful. Due to the immutable laws of physics, there’s some energy lost as part of the process, and it may be as much as 20%. That slighlty blots the eco-footprint of an EV, as the original energy has to be produced somehow, which comes at an evironmental and fiscal cost. But since when has laziness prevented humans from choosing convenience over conscience?